Preeclampsia, Placenta, Hypoxia-inducible factor-1α (HIF-1α), Heat shock protein 70 (HSP70). There is no definite clinical conclusion over the specific pathogenesis of preeclampsia at present, and it is generally believed that vascular endothelial cells are damaged due to intrusion of abnormal trophoblastic cells into the myometrium of the human body [1,2]. Hypoxia-Inducible Factor (HIF) in placental tissues of patients with this kind of illness presents abnormal expression and corresponding products are produced through signal transduction pathway of trophocytes . This process helps to provide relevant basis for pathogenic factors of preeclampsia. Many studies on Heat Shock Protein (HSP) have verified that stress factors can have an impact on substance synthesis and participate in activities of intracellular proteins, such as assembling and folding, so as to regulate signal transduction, growth, and differentiation [4,5]. Moreover, as a kind of endogenous protective substance, once damaged, HSP can realize self-protective effect. 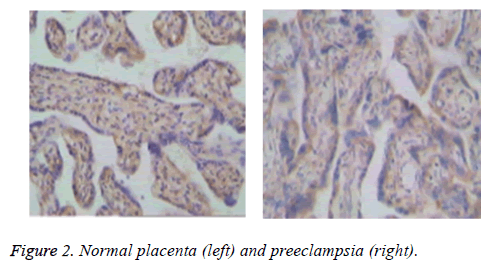 For analysis of HIF-1α and HSP70 expressions in placental tissues of preeclampsia, detailed explanation is as follows. Fifty patients (experimental group) with preeclampsia in our hospital and 50 normally pregnant women (control group) were recruited in this study. The inclusion period of subjects in both groups was identical, i.e., June 12, 2016 to June 12, 2017. Twenty-eight patients in the experimental group had mild illness, whereas 22 had severe illness. Their ages ranged from 21 to 38 y, with the average age being 29.36 ± 2.20 y. The shortest and longest gestational weeks were 32 and 41 weeks, respectively, with the average value being 36.56 ± 1.22 weeks. Conversely, in the control group, the patients’ ages ranged from 22 to 37 y, with the average age being 29.12 ± 2.14 y. The shortest and longest gestational weeks were 32 and 40 weeks, respectively, with the average value being 36.35 ± 1.14 weeks. No significant differences in age and gestational weeks were observed between the two groups through a comparison (P>0.05), so favourable comparability existed. SP Immunohistochemistry (IHC) kit and polyclonal antibodies were used in this study. Materials were drawn within 0.5 h after placental expulsion. Tissue blocks (middle section of the maternal placenta) were cut, with their length, width, and height all being 1 cm. Formaldehyde (10%) was used for specimen fixation, and after 24 h, specimen sectioning was carried out after embedding treatment through paraffin wax with thickness of 4 μm. IHC staining treatment was given, and then the operation was implemented strictly according to the corresponding steps. Evaluation was made through the Shimizu method, and section staining status under a microscope was analyzed, where positive result indicated brown particle deposition phenomenon. Grading was conducted according to intracellular staining power and number of positive cells. If intracellular staining was unclear or without staining phenomenon, showed even faint yellow staining phenomenon, or was consistent with the background, then it was given a value of 0. If there was a small quantity of faint yellow particles in plasma or nucleus with obviously higher power than the background, then a value of 1 was given. SPSS 17.0 statistical software was used to record the data of the two groups. Enumeration data were expressed by percentages and rates, and χ2 test was used for comparison. Measured data were expressed by mean ± standard deviation (x? ± S), and T-test was used for comparison. If difference of intergroup data is significant, then it is expressed by P<0.05. As shown in Figure 1, positive expression of HIF-1α showed yellowish brown particles filling the placental syncytiotrophoblast, cytoplasms, and karyon, which mainly existed in the cytoplasm, and positive expressions of syncytiotrophoblasts and cytotrophoblasts were (++), (+++) and (+). Figure 1: Normal placenta (left) and preeclampsia (right). The positive rate of expressions in placental tissues of pregnant women in the experimental group was 80.00% (40/50), whereas that in the control group was 28.00% (14/50), so differences in positive rates of expressions were significant between the two groups (P<0.05). In Figure 2, particles with positive HSP70 were light to dark brown, and they mainly existed in the cytoplasm of syncytiotrophoblasts. Moreover, some presented cell nucleus staining. For pregnant women in the experimental group, positive rate of HSP70 expression reached 78.00% (39/50), whereas that in the control group reached 32.00% (16/50), so differences in the positive rate of HSP70 expression were significant between the two groups (P<0.05). 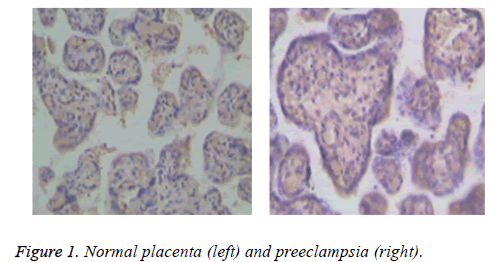 Figure 2: Normal placenta (left) and preeclampsia (right). Based on analysis, HIF-1α and HSP70 presented positive correlation, where r1=0.407 and P=0.035. The two had positive correlation in the experimental group, where r1=0.732 and P=0.016. The activation degree of HIF-1α had positive correlation with the state of the illness, where r1=0.796 and P=0.000. In Table 1, positive HIF-1α expression in placental tissues was higher in the preeclampsia group than in the control group, and positive rate of HIF-1α expression was higher in patients with severe preeclampsia than those with mild preeclampsia (P<0.05). Table 1. HIF-1α staining results in placental tissues of patients in the preeclampsia group (experimental group) and control group. In Table 2, positive HSP70 expression in placental tissues was higher in the preeclampsia group than in the control group, and positive rate of HSP70 expression was higher in patients with severe preeclampsia than those with mild preeclampsia (P<0.05). Table 2. HSP70 staining results in placental tissues of patients in the preeclampsia group (experimental group) and control group. For preeclampsia patients, local blood supply is reduced due to vasospasm; therefore, tissues are under anaerobic condition with increased HIF-1α expression and obviously improved anoxic tolerance. Fifty patients (experimental group) with preeclampsia in our hospital and 50 normally pregnant women (control group) were recruited in this study. The results showed that positive expressions of HIF-1α and HSP70 in placental tissues of patients in the experimental groups were 80.00% and 78.00%, respectively, both of which were higher than those in the control group. When the illness aggravates, positive expressions of HIF-1α and HSP70 will gradually increase. HIF-1α is rapidly degraded through the pantothenic acidproteolytic enzyme system under unstable oxygen partial pressure, which has a short half-life period of 5-10 min. Relevant studies have pointed out that in early pregnancy, there is a relative shortage of blood supply in the embryo, HIF has reached a corresponding level, and the embryo has favorable tolerance against hypoxic environment, which causes trophocyte development [6,7]. As gestational weeks increase, the embryo will be gradually under hyperoxic status, which is convenient for reducing the level of HIF. Based on analysis, HIF-1 has a heterodimer structure, and HIF-1α and HIF-1β jointly constitute this type of substance, where HIF-1α can activate genetic expression and exert an effect on HIF-1 activity . In the case of preeclampsia, vasospasm will reduce the blood supply, cause hypoxia of local tissues, increase HIF-1α levels, and improve tolerance degree of tissues against anoxic conditions. The mechanism of action obtained through analysis is as follows [9,10]: Under histanoxia, the pathway for ubiquitin-proteasome degradation is blocked, which reduces HIF-1α ubiquitination and degradation. Under hypoxic condition, HIF-1DNA binding activity will be induced. If EPO3 enhancer is bound, erythrogenin transcription will be enhanced so that oxygen carrying capacity of local tissues will be enhanced. IHC scheme was used in this study to analyze HIF-1α expressions in normal pregnant women and pregnant women with preeclampsia. The HIF-1α level in the experimental group was obviously higher than that in the control group. Through analysis, HIF-1 plays a significant role in regulating multiple cells and systems under anoxic and ischemic conditions. However, in the present clinical study, its effect on preeclampsia has not been fully elucidated. With further studies, this index may become a prevention and treatment approach for diseases such as preeclampsia and hypertensive disorder complicating pregnancy. HSP70 plays a role in regulating cell proliferation, embryonic development, and bioactive molecules. Moreover, it is closely related to early embryonic development status. HSP70 immune positive reaction mainly occurs in endometrial stromal cells. With gradual increase in gestation, the number of positive cells will gradually increase. The expression of HSP70 in the secretory phase is stronger than that in the proliferative phase, and it can exert corresponding effect on compounds of technological steroid receptors. When the content of HSP70 continues to increase, it will help in the assembling and transportation activities of technological steroid receptor compounds. In addition, as estrogens are gradually enhanced, they will facilitate HSP70 synthesis, which increases cellular proliferation activity. HIF-1α and HSP70 play non-negligible roles in pregnant women with preeclampsia, so clinical study on these indexes should be strengthened so as to provide relevant criteria for the prevention, diagnosis, and treatment of illnesses. Vaiman D, Calicchio R, Miralles F. Landscape of transcriptional deregulations in the preeclamptic placenta. PLoS One 2013; 8: e65498. Darwish IA, Askal HF, Refaat IH, Marzouq MA, Ahamad SR. Novel microwell-based spectrophotometric method with high throughput for determination of 4-quinolone antibiotics in their pharmaceutical formulations via spontaneous formation of water soluble ion-pair complexes. Lat Am J Pharm 2013; 32: 1273-1279. Martin E, Ray PD, Smeester L, Grace MR, Boggess K, Fry RC. Epigenetics and preeclampsia: Defining functional epimutations in the preeclamptic placenta related to the TGF-β pathway. PLoS One 2015; 10: e0141294. Mahdi TN, Gholamhassan V, Hossein AE, Vida H. Acute and chronic effects of opiates and dopamine on yawning, penile erection and genital grooming behaviors in male Wistar rats. Biomed Res-India 2017; 28: 6931-6936. Barrera D, Díaz L, Noyola-Martínez N, Halhali A. Vitamin D and inflammatory cytokines in healthy and preeclamptic pregnancies. Nutrients 2015; 7: 6465-6490. Lim R, Barker G, Lappas M. TREM-1 expression is increased in human placentas from severe early-onset preeclamptic pregnancies where it may be involved in syncytialization, Reprod Sci 2014; 21: 562-572. Zhu GF. Exposure of Bisphenol A (BPA) derivatives affect the metabolic elimination of Alzheimer’s diseases treatment drugs. Lat Am J Pharm 2017; 36: 1753-1759. Chen S, Yin C, Lao T, Liang D, He D, Wang C, Sang N. AMPK-HDAC5 pathway facilitates nuclear accumulation of HIF-1α and functional activation of HIF-1 by deacetylating Hsp70 in the cytosol. Cell Cycle 2015; 14: 2520-2536. Gogate SS, Fujita N, Skubutyte R, Shapiro IM, Risbud MV. TonEBP and HIF coordinate Hsp70 expression in hypoxic nucleus pulposus cells: Role of Hsp70 in HIF-1α degradation. J Bone Miner Res 2012; 27: 1106-1117.